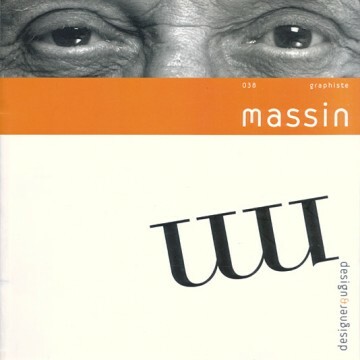 Design & Designer 038 – Massin, official blurb: “We’ve all got a Massin at home”, announced the exhibition in Strasbourg dedicated to him in 1995, and the event’s title certainly wasn’t stretching the truth when you consider the career of this French graphic designer, who started out in the 1950s and whose influence on French publishing is still very tangible today. He is a master of many trades: typographer, graphic designer, photographer and writer. For 20 years Massin was the art director at Gallimard, at a time when the job hadn’t really arrived in French publishing. He redrew the 'nrf' logo of the Nouvelle revue française in 1958 – it’s still in use today – and developed the visual identity of book series such as Folio (1972) and L’Imaginaire (1976). Massin has also worked with emblematic figures in French literature such as Raymond Queneau and Eugène Ionesco. In devising what became the cult layout for La Cantatrice Chauve (The Bald Prima Donna) Massin created a truly graphic mise en scène which further enhanced the power and originality of Ionesco’s play text. He has also designed books that have made a lasting mark on the world of publishing, such as Les Mariés de la Tour Eiffel (The Eiffel Tower Wedding Party) and Typoésie (Typoetry). Playing with typography as others play with words, his layouts give a fresh dimension to the text, notably in seeking to reproduce the modulations of the human voice through typography. Though often experimental, Massin’s designs are arrestingly simple and obvious. His work has been shown at many exhibitions, notably in Seoul.